I see what you're saying, but to me it honestly seems like those horns follow the contour of the head, much like the G1 Avohkii. Is that flat enough for you? Sorry for not being very active the past few days. Get ready for a long post. I'd recommend finding a way to make molds more definitive for the future, by which I mean reducing the resin bleed so it's easier to clean them up, I say this because the protector masks don't have any eyes, and I imagine it being a pain to remove the overflow from the tiny holes.I'd imagine the easiest fix is to make the 'struts'(the negative holes) go further into the other side of the mold.Looks like it's coming along nicely nonetheless. Sounds like you have a little expierence with molds yourself. There is a reason there is a lot of flashing with the masks is because I poured the resin into half the mold and pushed the other side in. I did it because I was a little impatient to try and cast the masks. In the future i will widden one end of the air holes so I can pour the resin in while the two halves are together. This will reduce the flashing significantly. To fix that, make a modification to the mask that is easily recognizeable, and inform communities that masks with that modification are replicas. There are several ways to avoid them being resold. That is a good idea. I can cut a notch out of the mask clip section. That would be a deffinate tell tale sign. Is the "final" version of the MOUP currently on Shapeays? From the 3D image it's a bit hard to tell. Give it one more week, If I get any more time to work on the mask I will try and get it done by then. So... Why isnt this called Cyber-Hand's Forge again? Thanks for changing the title. I am happy with what it is at the moment. Just wish I could still edit the first page So people can see everything without needing to scroll through the entire chat to find specific masks. The legs are a rather nice design. I don't think they would be usable with the Star Wars armor pieces since there isn't really a way to attach them without using glue. I feel the best way to do it would be in two pieces. One made out of resin with gunmetal powder and the other with clear resin dyed a certain colour that can be swapped. The mask of ultimate power does look very cool but I can see the same problem happening with the similar image posted before. The spikes on the side of the head would be very fragile, This is due to how long and thin they are. It would also make posing much harder, remember how tricky they skull spider are to put on the head with the arms curved around. I think this is why Lego decided to go with a differant design. I will probably create a poll to see what pieces of art people would want to see made real the most. So is there a final version of the MoUP? Thanks! When I have the mask done I will annouce it here. Just keep your eyes peeled for it. From what I can see in the rest of the chat it is just you. I think I can explain using the image to show that you are mistaken though. As you can see I have zoomed in and highlighted the lines that show there is a curve in the vahi's fins. The blue line shows that the inside of the fin has only one plane with three prints. The red line show that the centre part curves backwards. 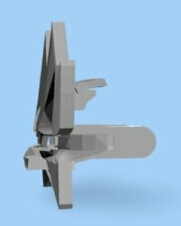 there is definitly a curve in the fins but that curve isn't as strong as the one in your model. The concept art Mask of Time isn't even an accurate representation of what the real model would have looked like. The thing about art is that it's heavily stylized. What's next? Are you going to tell LEGO that their final MoUP was wrong because the concept art was also heavily stylized? That moment when you realise you need to remake thy mask cause a better shape of it was released by LEGO. Gosh, Matt Betteker was such a terrible artist, couldn't even get his shadows right for a mask he plopped down in like 15 minutes. I'm assuming you're being sarcastic...However, I'll disagree for the benefit of the discussion. He has a conceptual style that was more organic and lifelike than previous Bionicle artists...his strength in how he handles light, with strong emphasis on forms and shapes lends to his success as a concept artist. Just because he has a style you don't prefer doesn't make him a terrible artist...since the source material we have in the comic is similar in shape to the painting, we can recognize the mask as the Vahi, and that's the only point he has to get across for the image to be successful. Whether you like the style of art is subjective and doesn't define Matt's art. Okay interesting thing about light in this image. It doesn't make sense. The sun is directly behind tahu. so it wouldn't be casting that shadow the way it is. The inner left fin would also be a lot brighter like the right fin. All right everyone the G2 mask of time is done. I put it up on shapeways two weeks ago, and am not going to be changing it unless we get images for what the final version was supposed to look like. (not happening unless we get another art book.) I will be making some things from the concept art book but I would rather move on from this line of discussion since it won't change anything. I rest my case this is a waste of everyones time now. Sweet! I hope to pick one up very, very soon! Guys, you do realize making these masks takes time and aren't exactly easy to make right? I don't see why you have to be so negatively nitpicky over differences in how you perceive something. Cyber-Hand made the masks and if you don't like it don't get it. 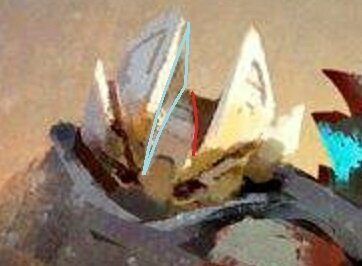 There's a better way about requesting improvements though honestly his masks are pretty much fine as is, who cares is the distance is off by a milimeter or is curved ever so slightly differently? These aren't commissions per-se. He's making the models and selling them in an open market, and isn't guaranteed any pay from a particular person, so from a logical perspective, this is something he either feels obligated to do or is a hobby that he can share with others that desire it. Hey @Cyber-Hand, I was wondering if you could make this mask from some 2015 concept art (it is not in the art book, however you can find many pictures of it online). 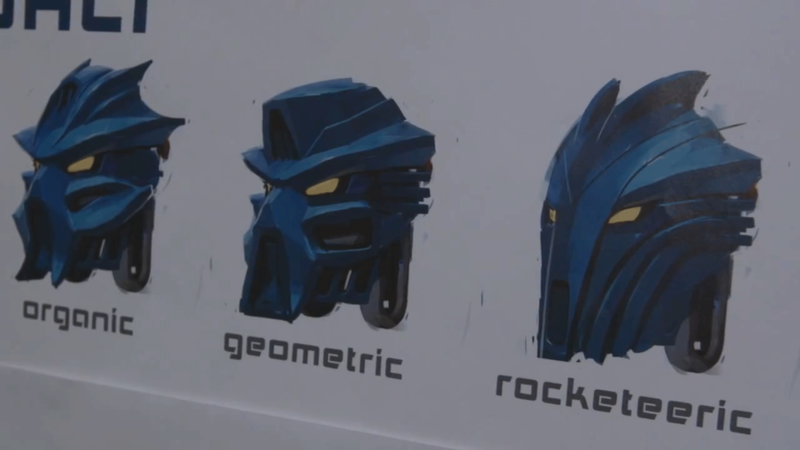 I'm talking about the "rocketeeric" design. As always, I understand if you say no, I can imagine how busy you are.